Kimberley Town Centre has a fantastic range of businesses and shopping facilities on offer, including a supermarket and a small precinct. So why not give it a visit? Main Street is lined either side with a strong mix of different retailers and for the more traditional shopping experience, there is the Victorian Shopping Area (complete with cobble stoned road) of James Street, which includes many customary high street shops. Kimberley has a brilliant parking provision for a town centre of its size, as well as being served by the frequent Rainbow 1 bus service from Trent Barton, which runs into the town centre in both directions every 10 minutes during the day, leaving from the City and Eastwood Town Centre. Kimberley has 4 Council run public car parks, as well as further dedicated supermarket parking and spaces available to service businesses at Greens Lane Shopping Precinct. Victoria Street Car Park, NG16 2NH is FREE ALL DAY on Saturdays. All other Car Parks in Kimberley are not chargeable. For further information on the locations and full details of charges and monitoring hours, please visit Broxtowe Borough Council’s website. 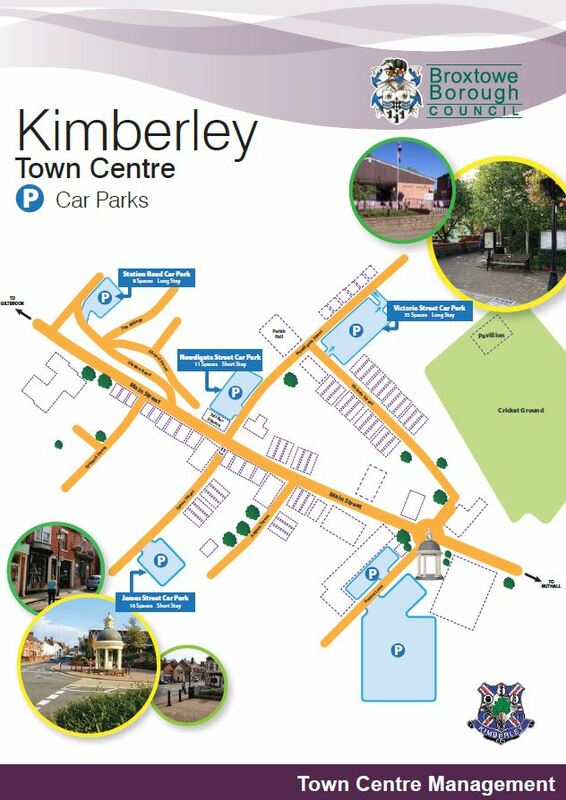 Below is a downloadable map with all the parking provision available in Kimberley Town Centre in PDF format.